In case you don’t have teeth, you probably have a hard time smiling, eating and so much more. A huge gap in your smile is not really what you want and this can be demoralizing to your self-esteem. This makes you avoid social meetings and reduces the chances of you enjoying life. In addition, missing teeth make it hard for you to speak clearly. Apart from that, missing teeth will make you look older that you actually are. Partial dentures designed by Tigard dentists can be a perfect replacement for your missing teeth. Partial dentures are an ideal solution if you don’t have some teeth because they fill up the gaps in your smile and assist you in so many ways. A partial denture easily rests on a framework that hinges to your natural teeth. At times, there are crowns fixed on some of your natural teeth and act as anchors for the denture. Partial dentures are ideal because they offer a removable alternative compared to bridges. Partial dentures exist in two types. They include; fixed and removable partial dentures. The state of the gap is one of the reasons that determine what form of partial denture will be prescribed by a dentist in Tigard. A fixed partial denture is also known as a dental implant bridge. This bridge permanently attached artificial teeth straight to the jaw with a dental crown. It can also be attached to the gum tissue with dental implants. A removal partial denture, also known as a dental bridge occupies the gap between two healthy teeth and consists of replacement teeth. They are usually connected to a gum-colored plastic base. 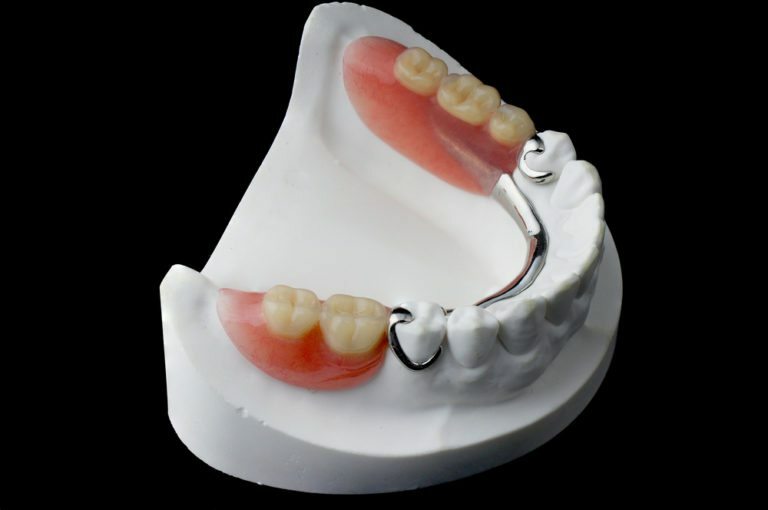 The removable partial dentures are linked by a metal framework that’s makes sure they are in place. The removable partial dentures normally have replacement teeth fixed to an acrylic base that matches the color of your gums. The acrylic base may be able to cover a metal framework. Partial dentures also have some form of grip/clasp that attach to your natural teeth. This helps to ground the dentures in place. Will I have Problems Using Partial Dentures? Just like a baby, you will have to learn to use partial dentures step by step. It may be difficult, or feel odd or tight at first but with time they will be easy to use. Do not force the denture into place by biting down. This may easily destroy the clasps or damage the teeth. Moreover, the partial dentures should not be worn 24 hours a day. A Tigard dentist recommends that you take out the partial dentures at bedtime and put them back when you wake up. Replacing your missing teeth with partial dentures will assist greatly in improving your appearance as well as the smile. Without the support of these dentures, the facial muscles will sag, this makes a person to look older than they actually are. Partial dentures will be vital in assisting you to eat and speak comfortably.